Need to roast a friend, boss, co-worker, politician? If this doesn't get 'em, they're immune to being got. Local man Casey Jones announced today that he was asking the Guinness Book of World records to proclaim his collection of pubic hair the largest in the world. Over the years Casey admits his quest for pubic hair expanded to include public restrooms, cheap motels, bathrooms of friends, even brothels. Casey says he’s considering suing for inclusion. He claims no other collection in the country can even begin to rival his, and, he says, that’s news. 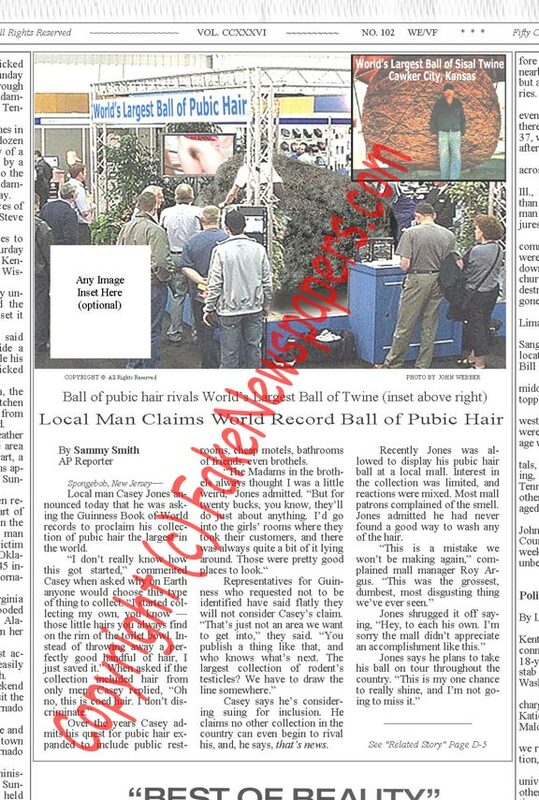 Recently Jones was allowed to display his pubic hair ball at a local mall. Interest in the collection was limited, and reactions were mixed. Most mall patrons complained of the smell. Jones admitted he had never found a good way to wash any of the hair.